The Classical Liberal Constitution: The Uncertain Quest for Limited Government. American liberals and conservatives alike take for granted a progressive view of the Constitution that took root in the early twentieth century. Richard Epstein laments this complacency which, he believes, explains America’s current economic malaise and political gridlock. 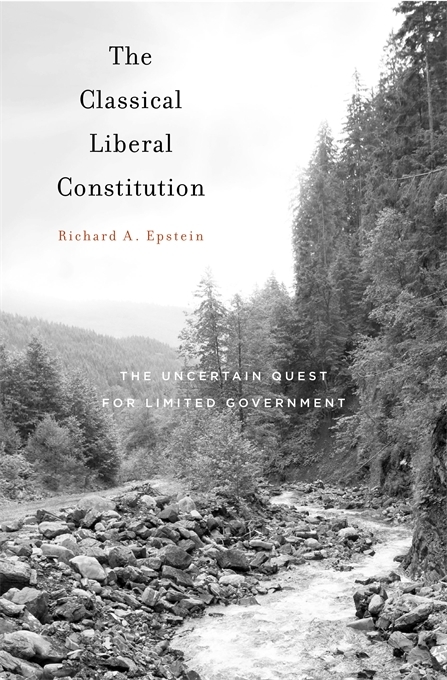 Steering clear of well-worn debates between defenders of originalism and proponents of a living Constitution, Epstein employs close textual reading, historical analysis, and political and economic theory to urge a return to the classical liberal theory of governance that animated the framers’ original text, and to the limited government this theory supports. Grounded in the thought of Locke, Hume, Madison, and other Enlightenment figures, the classical liberal tradition emphasized federalism, restricted government, separation of powers, property rights, and economic liberties. The most serious challenge to this tradition, Epstein contends, has come from New Deal progressives and their intellectual defenders. Unlike Thomas Paine, who saw government as a necessary evil at best, the progressives embraced government as a force for administering social good. The Supreme Court has unwisely ratified the progressive program by sustaining an ever-lengthening list of legislative programs at odds with the classical liberal Constitution. Epstein’s carefully considered analysis addresses both halves of the constitutional enterprise: its structural safeguards against excessive government power and its protection of individual rights. He illuminates contemporary disputes ranging from presidential prerogatives to health care legislation, while reexamining such enduring topics as the institution of judicial review, the federal government’s role in regulating economic activity, freedom of speech and religion, and equal protection.